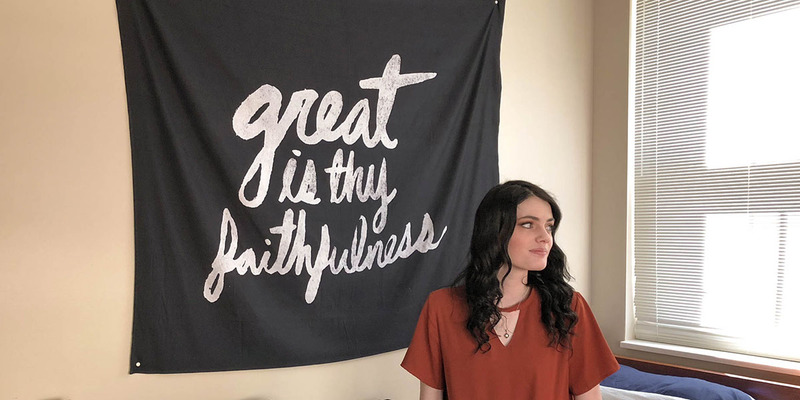 Maddi Sullivan sits on her dorm room bed in the MBU Apartments recently, honestly and openly sharing her difficult story of tragedy, challenges and, ultimately, triumph through Jesus Christ. A familiar face and voice to many students at Missouri Baptist University, Maddi Sullivan, sophomore worship leadership major, serves in the MBU Spirit Wing worship group, the university’s Chapel Band, she is employed part-time with the worship ministry at Concord Church in South County, Missouri, and travels with her own collective group of close-knit musical friends. However, less familiar is the story behind her praise. Sullivan grew up in West Frankfort, Illinois, a small town which she nicknames “the podunk,” or “redneck, rum in the corn fields, kind of thing,” as she put it. As second-born with three brothers, she recalled not growing up in a home where church was emphasized. “It wasn’t that, ‘Oh we hate Jesus.’ It just wasn’t a part of our life. That was just how it was, and I didn’t care,” Sullivan said. Her family, now supportive Christians, at the time had distanced from the faith. Despite her musical taste from early on, Sullivan was pushed by family and economic reality to pursue only what was considered “real jobs,” or 9-to-5 careers, which led to her involvement in journalism during her junior and senior years at Frankfort Community High School. Looking back, she expressed the other side of that reality. “I feel like I was mindlessly looking for a thing to fill my time — give me a career and a purpose while I was living there. I knew I couldn’t make a career out of my music, a career out of my worship by living there because that’s not very common where I come from. So, I feel like I was settling for these ideas,” Sullivan said. “I felt like there is a love for that but I was never fully committed to that. I just talked about it because I had to have some idea of what I was going to do. And I was trying to like go with the ‘realistic option,’” she said, making air-quotes with her hands. However, Sullivan ended the three-year dating relationship amicably during their senior year. After her decision to follow her calling to leave Southern Illinois, she scheduled her first university tour to what would later become her college home, MBU in St. Louis. Entering MBU as a freshman in fall 2016, Sullivan had been a Christian for about four years, having stepped into a church for the first time without family or a holiday in 2012, at age 15. “All I wanted was something that was real and honest because I felt like I had been lied to and hurt by so many people,” Sullivan said. Sullivan said she had been sexually abused by someone close to her at an early age and later by another person who she knew well. Even when she became saved in August 2012 at Cornerstone Christian Church, now called Redemption Church in Johnston City, Illinois, she was afraid to trust people because of the way she had been abused by people in her life. “I was so broken and I was feeling like I wanted to take my own life and I felt like I was worthless because I had been treated so badly in my life, and at that point when I first came to church was actually at the point where I decided that God must not be real. Like, God must not be this great awesome God that everybody talks about and flaunts at other people in my hometown because why would a God like that allow people to go through such awful things at such a young age and they didn’t do anything?” she said. Sullivan continued: “And I wrestled with that most of my life, wrestling with, Was it my fault that I was abused? Was it my fault that the things that happened to me did? And I went to church solely because it was my last resort and I was very suicidal and I was self-harming and I just felt like there was nothing left. “Like there was a time I thought I had no future at all and I thought that I was just not meant to be anything else except the person that got abused, and that was it for me and when I went into church, I did not have an open mind and I was very against it, but I wanted to be able to say that I’d tried everything to get better and to feel better and to overcome it. “So I went to church for that purpose and I didn’t expect anything. But the one thing that spoke to me, because I don’t remember the thing that was preached when I went to church, I just didn’t get it and I didn’t know how to understand that, but what I do remember is the music. “And I remember when they played their music and it was like worship music, like contemporary worship music, which at the time was like old Hillsong and like that kind of stuff, and I had never even realized that Christian music could be like that. Through the new worship she found, she also discovered great redemption. “I feel like when I talk about the things that I went through then, I’m not talking about myself. I feel like I’m talking about somebody else because God has just healed my heart. I’ve seen that,” Sullivan explained. “I believe so much in the healing power of Jesus because he has healed the most impossible situations in my life. I want to write music that does the same thing for other people that God can use to talk to the same people that are hurt and broken and feel like they have nothing left. Sullivan also finds practicality through her musical ambitions. “I’m quoting songs all the time of things that have ministered to me and I want to be able to do that as well,” she said. “I wanna be able to write things that help people come back to the heart of the Lord because that is what heals, that is what changes things, and what makes all of this broken crap in this world make sense. Sullivan is not new to writing songs of her own, desiring to release new music in the near future. 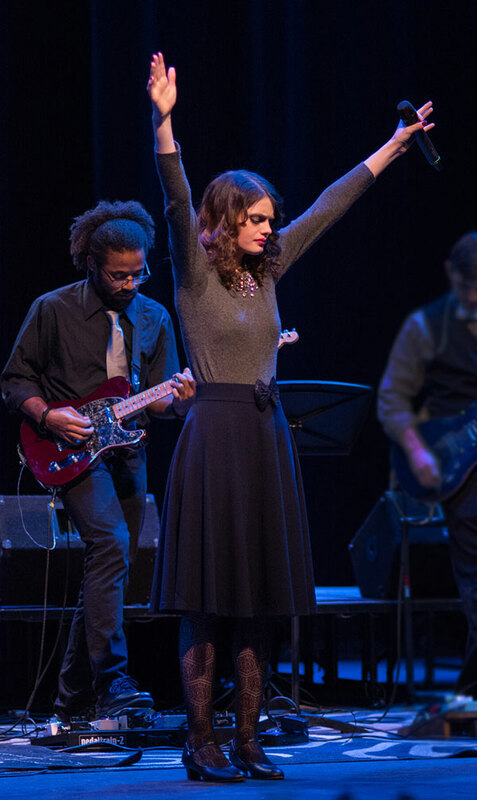 Maddi Sullivan sings with the MBU Chapel Band during a chapel worship service. Although her EP was released two years ago, she has not stopped writing as apparent when asked which of her writings has been her favorite. The songwriter explained: “That’s just been like my heart cry forever. You have to check yourself when you do the kind of ministry that I do. When you’re on the stage or anywhere where you’re on a platform, you have to check yourself and why you’re doing what you’re doing. Her passion for MBU’s chapel services shone through the tears in her eyes. “This is such a unique opportunity to be a part of Chapel Band, to be a part of the chapel services, just because so much of our campus is lost,” Sullivan said. “When I think about that, they’ll see a lot of people on the stage and they’ll think lots of things about those people on stage, my prayer is that when I contribute to that ministry, what I bring is a genuine relationship with God and a genuine love for those people, not just the ones that are saved, because I love those that aren’t saved, if not more. But, her deep heart for her spiritual mission spoke louder than the amount of hours required. Not always are the worship songs easy for her to sing, but she does not fear the challenge, but sees the challenge as one worth embracing. Breaking the mood, Sullivan shared her excitement about the new guitar she planned to pick up over spring break, as well as opening up on her post-graduation dreams for 2020 involving moving to Nashville, Tennessee.